Beverly Hills: Sunday, March 19, 2017 at 7:00 p.m.
Pasadena: Monday, March 20, 2017 at 8:00 p.m. 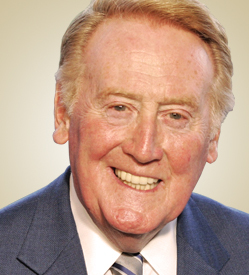 Thousand Oaks: Tuesday, March 21, 2017 at 8:00 p.m.
Redondo Beach: Wednesday, March 22, 2017 at 8:00 p.m.
Vin Scully is widely regarded as not just one of the greatest baseball announcers of all time, but perhaps the greatest voice in all of sport. Arguably the most popular figure in Southern California, Scully came west with the Dodgers in 1958 and has broadcast their games on radio and television ever since. His unparalleled story telling ability, timing, and mellifluous tones have been a uniting force in a geographically massive region. In 1982 Scully was inducted into the National Baseball Hall of Fame – that was 33 years ago which in and of itself is longer than most broadcasters’ entire careers but less than half of Scully’s. He was named the top sportscaster of the 20th century by the American Sportscasters Association in 2000 among countless other well-deserved awards and honors. He is now set to retire after he completes his 67th consecutive season as the “Voice of the Dodgers.” and signature introduction to Dodger games: “It’s time for Dodger baseball! Hi everybody, and a very pleasant good day to you, wherever you may be,” will be missed when this season is over. Scully continues to rewrite the record book of his trade each and every time he goes on the air. The Dodgers were formed 127 years ago in Brooklyn are currently in their 53rd year in Los Angeles with Scully in the booth. He joined Red Barber and Connie Desmond on the Brooklyn Dodgers’ broadcast team in 1950, one year after graduating from Fordham University. In 1955, Scully had his most memorable moment behind the microphone, as he called the Dodgers’ first and only championship in Brooklyn. At the age of 25, he became the youngest person to ever announce a World Series game. During his unmatched career, Scully has called three perfect games, 25 no-hitters, 25 World Series and 12 All-Star Games. Iconic moments called by Scully include Kirk Gibson’s miraculous Game 1 home run in the 1988 World Series, Dan Larsen’s perfect game in the 1956 World Series, Hank Aaron’s record-setting 715th home run, Sandy Koufax’s four no-hitters (including a perfect game) and the scoreless-innings streaks of Dodgers greats Don Drysdale and Orel Hershiser. In Los Angeles, Scully has called Dodgers World Series championships in 1959, ’63, ’65, ’81 and ’88. In addition to his legendary career in baseball, Scully has called play-by-play of the National Football League and PGA Tour events on CBS-TV from 1975-82 and play-by-play for Major League Baseball’s Game of the Week, three World Series and four All-Star Games on NBC-TV from 1983-89. Scully also called play-by-play for the World Series on CBS Radio from 1990-97. In all, he has called 25 World Series and 12 All-Star Games.